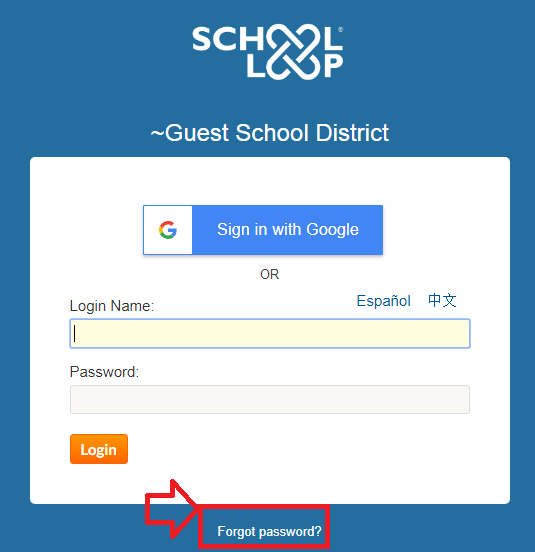 School Loop offers a self-service password reset option in case users with the default login method are not able to log in, a school administrator will be the one responsible for resetting the password for other login methods. Go to the login page for your school and click the "Forgot password" link as pictured below. The mobile app has a similar link. To reset your password, you may use your email address or login name. Students may also use their student ID number. After submitting the form to reset your password, look for a message from School Loop - check your spam folder if the message doesn't arrive after a few minutes. It will contain your login name and a temporary password. Any administrator can reset the password for student and parent accounts. Any faculty or staff member can reset the password for any student at their school. This is the only method of password recovery that works when a student's account does not have a valid email address. Most of the teachers and staff do not know how to help students log in. If so, point them to this support article. Contact a person at your school or district who has administrative rights to School Loop. They can resolve the majority of login issues. If you use your school's Active Directory login name and password to log into School Loop, you will have to contact your school or district about setting a new password. If your district uses our Google Sign In option and it is not working for you, seek password help from your email administrator, which could be either Google or your district IT department. Submit a support ticket. Be sure to tell us the name of your school and district.